See also: Beverage, Milk; Buttermilk; Sweet Milk; Town Milk. 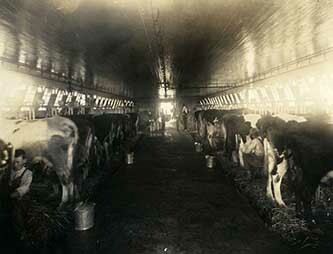 Until commercial dairies became commonplace in the early years of the twentieth century, milking dairy cows was a daily chore on North Carolina farms, providing families with fresh milk, cream, and butter. In 1914 John A. Arey of Iredell County was named to the dairy division of the U.S. Department of Agriculture and began assisting North Carolina farmers in good dairy management. Arey was a pioneer in farm extension work and helped establish high standards for dairy farming in the state. After 1900, in areas of North Carolina where farms were changing from row crops to livestock (primarily the Piedmont and western regions), some farmers with milk surpluses started regular dairy routes. These routes gave farmers ready cash each month rather than forcing them to wait for the annual row crop harvest. Small dairies, or creameries, usually served nearby geographic areas, selling fresh milk, butter, and ice cream to local families. By the early 1940s, such creameries were delivering milk to homes and grocery stores daily. These creameries often developed their own brand names in direct competition with some of the larger processors such as Pet and Sealtest. The year 1938 marked the beginning of a growth trend in North Carolina dairy herds and an improvement in the overall quality of milk in the state. In 1944, for the first time in North Carolina's history, the state produced enough milk for both home consumption and export to other states. North Carolina continued to appropriate funds specifically for dairy industry support in the annual budget from that time to the present. Dairy farmers were able to get more milk from each cow through better nutrition, care, and facilities. Eventually this success resulted in overproduction, and some dairy herds were sold off. In 1936 the Carnation Company of Wisconsin established a new facility in Statesville to produce condensed milk. By 1940 the Carnation factory was in full operation. Fresh milk was delivered to Statesville from initial receiving plants across the state at Albemarle, Shelby, Spruce Pine, and other areas as well as from nearby dairy farms. During the 1950s and 1960s, more than 35,000 gallons of milk were being received each day at the Carnation plant at Statesville. By 1953 more than 300 dairies existed in Iredell County, which has been the leading dairy county in North Carolina since records were officially kept. (Randolph, Alleghany, Alexander, and Rowan Counties have also maintained substantial numbers of dairy cows.) The state's dairy farmers sold their Grade A milk (a designation that signifies wholesomeness, not quality) to major processors in their region and across the state. Lower-grade milk went to Carnation in Statesville, along with surplus Grade A milk. As grocery chains grew larger they developed their own in-store brands, which were often sold at a lower price. This forced many dairies to merge with larger companies such as Dairymen Cooperative, which processed the dairy products for major grocery chains. The N.C. Department of Agriculture reported that in 1947 there were 350,000 dairy cows on North Carolina farms; that year these cows produced 175 million gallons of milk. Milk output per dairy cow continued to improve over the next half century, although the number of dairy cows in the state dropped drastically. By 1995 the average output per cow had increased to 1,894 gallons of milk. There were more than 400 commercial dairies in North Carolina at the start of the twenty-first century, maintaining approximately 69,000 dairy cows. Few of the small and medium-size creameries remained. A handful of specialty ice cream companies were exceptions and continued successful operations, such as Mooresville Ice Cream Company in the town of Mooresville. Committee. “Dairy Advantage” North Carolina’s Dairy Industry Stabilization And Growth Program Strategic Plan. Raleigh: North Carolina Department of Agriculture & Consumer Services, 2008. http://www.ncagr.gov/markets/commodit/dairy/dairy_advantage.pdf (accessed November 13, 2012). "Marketing - Dairy." Raleigh: North Carolina Department of Agriculture & Consumer Services. http://www.ncagr.gov/markets/commodit/dairy/index.htm (accessed November 13, 2012). "Dairy Advantage." The North Carolina Association for Dairy Stabilization & Growth, Inc. http://www.ncdairyadvantage.com/ (accessed November 13, 2012). DAIReXNET. North Carolina State University and North Carolina A&T Cooperative Extension. http://www.extension.org/dairy_cattle (accessed November 13, 2012). McLaurin, U. P. "Long Meadow Farms Deliver 22 Dairy Products." The E.S.C. Quarterly 20, no.1-2 (Summer-Fall 1962). http://digital.ncdcr.gov/u?/p249901coll22,451968 (accessed November 13, 2012). "State Approching Self-Sufficiency in Dairy Production." The E.S.C. Quarterly 13, no.1-2 (Winter-Spring 1955): 57-64. http://digital.ncdcr.gov/u?/p249901coll22,451981 (accessed November 13, 2012). "Photograph, Accession #: H.19XX.324.91." 1920-1930. North Carolina Museum of History. https://collections.ncdcr.gov/RediscoveryProficioPublicSearch/ShowItem.aspx?15564+ (accessed February 21, 2019). "Milk Bottle, Accession #: H.1987.80.2." 1945. North Carolina Museum of History. https://collections.ncdcr.gov/RediscoveryProficioPublicSearch/ShowItem.aspx?59973+ (accessed February 21, 2019). Thanks for contacting NCpedia. I am forwarding your question to our reference department for further research. I'm looking for any info regarding a small dairy that was in Mecklenburg County during the 20s and 30s. It was named Buena Vista Dairy and was owned by L.F. McCall. 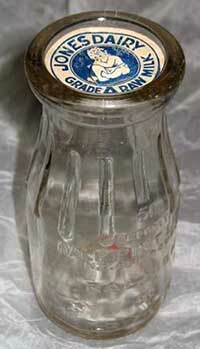 I recently dug a milk bottle from Hickory Grove Dairy, D.K. Winecoff Prop. I am assuming the bottle is from Cabarrus Co. Any idea as to the exact location? Thanks. Could you send me a picture of the Hickory Grove Dairy milk bottle. My great grandfather owned and operated Hickory Grove Dairy out of Mt. Ulla, NC. I would be interested in see a photo and I should be able to tell you if that is where it came from. That’s a very good question! Unfortunately, I have not been able to find anything the least bit definitive. I have looked at state agriculture reports, state fair brochures, city/county directories, and have done a number of other searches and haven’t found anything specific. Hickory Grove is a fairly common name, with at least 4 historic communities with the name in the state and perhaps a number of roads. So, it is possible that there was a dairy by same name in Cabarrus or perhaps Iredell or Mecklenburg. My next thought is for you to check the local historical societies and county library local history collections. They may know the answer very quickly as they would be the experts on local history. Sorry to be of little help! Please let me know if you have additional questions. Thank you Kelly for your response. I am now pretty sure that my Hickory Grove Dairy bottle is from Cabarrus Co. Just punch in" Hickory Grove Dairy, D.K. Winecoff". In "boards.ancestory.com" the Winecoff family writes about their grandfather running a dairy and selling milk door-to-door in the early to mid 1900's.